Meat & Livestock Australia (MLA) has launched “Celebrate Australia”, an advertising campaign connecting the lamb barbecue with an overview of Australia’s long heritage of hospitality, following on from the celebration of diversity found in the Spring 2016 You Never Lamb Alone campaign. 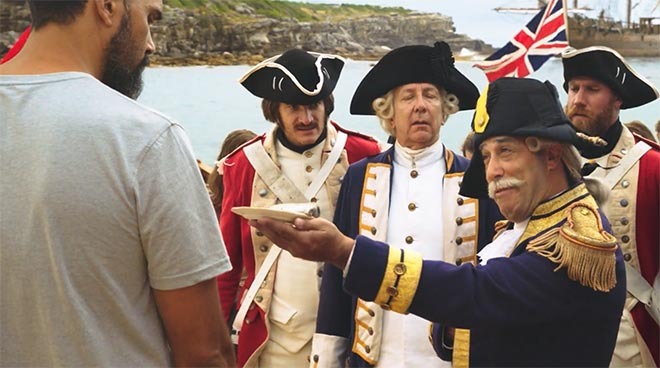 The Celebrate Australia with a Lamb BBQ advert opens on the pristine Australian coastline, as the nation’s first people search for the perfect spot to fire up a barbie. It doesn’t take long for other revellers to join the hosts. Every arrival, from the European settlers to the most recent of Australian migrants, is welcomed to the modern day lamb barbecue, each bringing their own dish and flavour to the celebrations. The resulting party is a truly united celebration of Australia, with indigenous Australians joined on the beach by the Dutch, British, French, German, Italian, Greek, and Serbian fleets, the boat people, the float people and even the vegans. Antarctic explorers Douglas Mawson and Ernest Shackleton work on the ice contribution. The all-inclusive barbecue has cameo appearances from Sam Kekovich, Olympian Cathy Freeman, rugby player Wendell Sailor, culinary artist Poh Ling Yeow, cricket player Adam Gilchrist and LGBTQI comedian Rhys Nicholson. The Celebrate Australia with a Lamb BBQ ad is being pushed out across digital, social and TV. In-store, product-focused point-of-sale will deliver lamb barbecue inspiration, focusing on the variety of different cuts and cuisines. Broadcast partner Channel Nine is supporting the campaign through integration with the TODAY show, Australian themed movies and on air features throughout Channel Nine’s Summer of Cricket. The campaign will also be supported by an on air partnership with the Nova Network’s Fitzy & Wippa nationwide program. On Australia Day, January 26, lamb-lovers from across Australia will unite at Parramatta Park, Sydney at The Big BBQ where both Channel Nine and Nova will be broadcasting live to their audiences. As part of the Nova partnership, some lucky Aussies will be flown in from across the nation to join in the celebrations. The Celebrate Australia campaign was developed at The Monkeys by executive creative director Scott Nowell, creative director Grant Rutherford, senior art director Paul Sharp, senior copywriter Mike Burdick, head of production Thea Carone, senior broadcast producer Jade Rodriguez, planning director Michael Hogg, managing director Matt Michael, group content director Humphrey Taylor, content director Katie Wong-Hee, content manager Victoria Zourkas, working with MLA group marketing manager Andrew Howie and lamb brand manager Matthew Dwyer. Filming was shot by director Paul Middleditch via Plaza Films with executive producer Peter Masterton, and director of photography Jeremy Fitzgerald. Music was composed by Adam Gock at Lamp Music. Sound was designed at Song Zu. Post production was done at Fin Design by VFX supervisor Richard Betts. Media was handled by UM. PR was handled by One Green Bean.